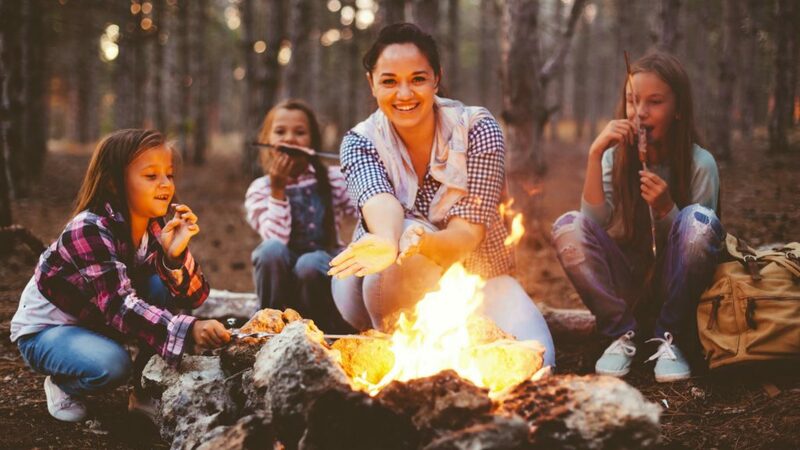 During summer outings, warmer temperatures, humidity, and lack of home safety controls make situations favorable for bacteria to be uninvited guests during camping, hiking, cookouts, picnics and even road trips. Food being prepared outdoors and the lack of safety controls of a home kitchen can be a recipe for danger – leading people to get sick. So, if you’re planning a family outing, make sure you follow certain food safety principles and procedures to ensure foodborne illness does not ruin your fun. Temperatures between 40 °F and 140 °F increases bacteria growth which can cause them to double their numbers within 20 minutes. And with summer warmer temperatures, along with the moisture needed for bacteria to flourish, makes the weather perfect for bacteria. If your eating outdoors, meal planning becomes more important. Your menu should include any of these items they can be stored in your pack without a cold source: peanut butter, jams, water or sealed juice containers, packaged snacks, chips, or fruits and nuts. Bacteria multiply rapidly at warm temperatures, and food can become unsafe if held in the “Danger Zone” (40 °F – 140 °F) for more than two hours. If the outdoor temperature is above 90 °F, food can become dangerous after only one hour. 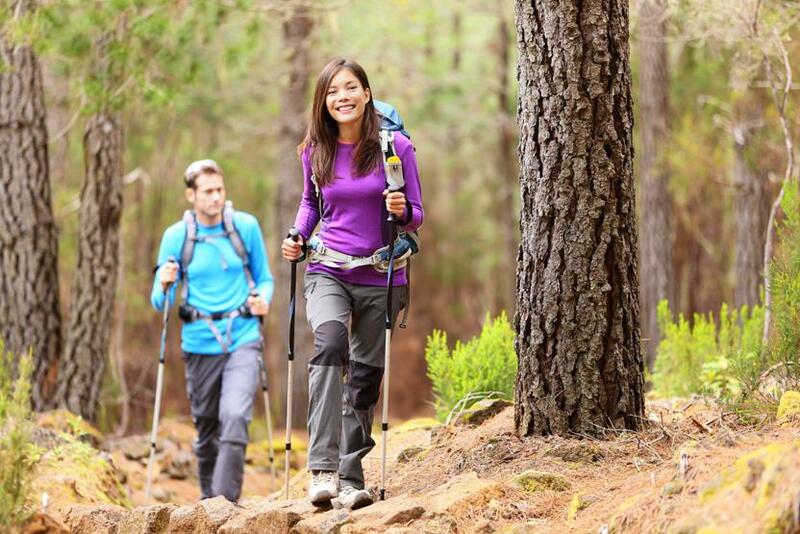 Before setting out for your hike, be sure to pack non-perishables like trail mix, energy bars, and granola bars. You may just want to hike for just a few hours. One meal and some snacks are all that’s needed for a short hike. Planning meals for a longer hike or camping trip requires more thought. You have to choose foods that are light enough to carry in a backpack and that can be transported safely. Make sure to pack clean paper towels, water, and soap for cleaning surfaces and your hands. Disposable moist towelettes also work well. Use clean plates. Don’t put foods eaten raw on the same platter that held raw meat or poultry. Any harmful bacteria present in the raw meat juices could contaminate them. If your meals will need some cooking, having the necessary equipment at your camping area is a must. Make sure you to pack any equipment you will need (e.g. portable stove) and be sure to use a food thermometer. Use a food thermometer to check the internal temperature of burgers, steaks, chicken and foods containing meat, poultry and egg dishes. Hamburgers, sausages and other ground meats should reach 160°F (71°C). All poultry should reach a minimum temperature of 165°F (74°C). Whole cuts of pork, lamb, veal and beef should be cooked to 145°F (63°C) as measured by a food thermometer placed in the thickest part of the meat, and allowed to rest for three minutes before eating. Fish should be cooked to 145°F (63°C). Cook eggs until yolks are firm, and cook foods containing eggs thoroughly. Keeping perishables cool is essential to avoid food becoming unsafe. 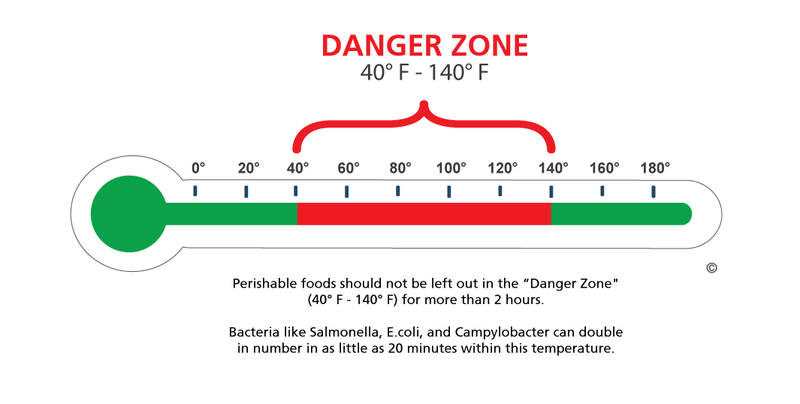 Bacteria multiply rapidly at warm temperatures, and food can become unsafe if held in the “Danger Zone” (40 °F – 140 °F) for more than two hours. Place leftovers in shallow containers and store them in a cooler immediately. Keeping perishables cool is essential to avoid food becoming unsafe. That’s why it is necessary to pack your basket or cooler with frozen gel packs.